Kuching has a long history as a trading centre which, over the centuries has brought people from various countries to settle in the area. Malays, Chinese, Indians, Europeans and others have joined the many indigenous groups of the region to create a city which a rich and unique cultural heritage. Before the 19th century, Sarawak was a typical Malay principality under the control of the Sultan of Brunei. Sarawak was peaceful place. However, there were some tyrant officers (Sultan Representatives) from Brunei. Many Sarawakians were forced to pay high tax and local officers were sacked without any reason. These caused a large demonstration against the Brunei Empire. James Brooke, a rich English Adventurer was asked by the Sultan of Brunei to stop the demonstration in Sarawak. The demonstrators were no match to James Brooke's watch, the Royalist. As a sign of appreciation, the Sultan of Brunei appointed James Brooke as Governor of Sarawak. James Brooke requested British Navy assistance to protect his position. He then chased out all Sultan Brunei's officers from Sarawak. With anger, the Sultan of Brunei tried to stop James Brooke but Brooke attacked the Sultan first. The Sultan was forced to sign an agreement and Sarawak was fully handed over to Brooke. From then onwards, James Brooke became the first English Rajah of Sarawak. 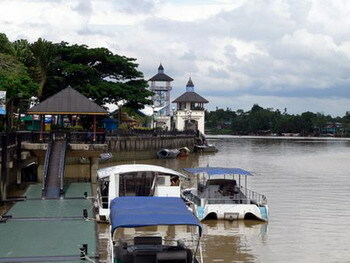 The arrival of James Brooke, who becomes the first English Rajah of Sarawak, marked the beginning of Kuching as an important administrative centre and consolidated its role as a port. His successor, Charles Brooke, 1868-1917, was responsible for many of the historic buildings still associated with the waterfront. Since 1963 when Sarawak became part of the Federation of Malaysia, Kuching has changed and developed into a flourishing modern city.